Gene Boffa’s second book release, “Deception” is a smart, masterful and exciting spy novel. The story is so real it could have come from today’s newspapers. “Deception” is a nonstop, action packed adventure novel concentrated on the world’s most talked-about countries and terrorist groups. 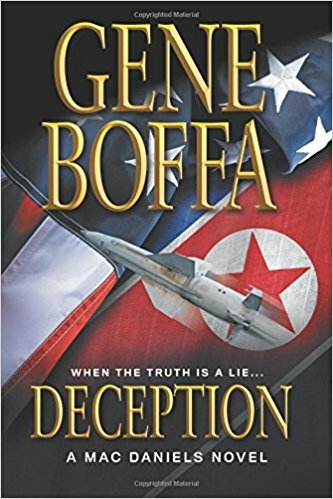 Boffa takes the reader on an international roller coaster ride of deceptive twists and turns while providing chilling details of the nuclear threats centered around North Korea and ISIS. Boffa brings unique expertise of military arms and knowledge of the horrifying consequences if weapons of mass destruction were employed. His distinctive descriptions of these powerful and deadly weapons of war is terrifying and Boffa creates a sense of fear in the readers minds while delivering an alarming reminder that these weapons are in the hands of unstable rogue nations who are determined to become World Powers. The plot begins with the discovery of a Japanese soldier abandoned on a desolate island in the Pacific who was left there to guard Sarin gas munitions since World War II. This fast-paced story progresses with an abundance of suspense and intrigue bringing the reader up to date with today’s political events and new world threats. As the threat of nuclear war looms near, Mac weaves a master plan of deception and against his better judgement, accepts the help of his girlfriend, Astrid. Together they must eliminate the threat of world-wide nuclear annihilation and because of the many life-threating experiences and governmental secrets they now share, Mac and Astrid’s intimate relationship becomes stronger than ever before. “Mac is an over-the-top, fun hero—007 without the gizmos…He’s faster, smarter, and deadlier than any opponent. The story is well-plotted and generally well-written, with occasional humor,” says BlueInk Review. Gene enjoys fishing and boating in his free time with his grandchildren. He has also traveled to many parts of the world with his wife, Patricia. Gene specializes in transactional law at the New Jersey law firm of Schumann Hanlon. You can learn more about Gene at geneboffa.com.